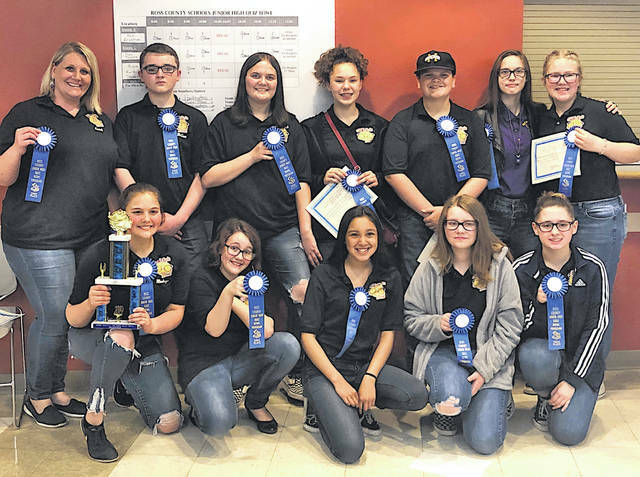 The Greenfield Middle School Quiz Bowl/Quick Recall Team took first place in the Ross County League Tournament on April 13 in Chillicothe. “I am very proud of this group of kids. They work hard and do their best in every match. Last year we went to state and placed 17th and also were first place at the league tournament. This has been a great group to coach and I will miss the ones moving on to high school next school year” said coach Kristen Wise. Pictured (front row, l-r) are Maddy Wheaton, Skylar Mazo, Kathy Alvarez, Kia Shuemake and Addie Simpson; (second row, l-r) coach Wise, Gavin McCune, Kiara Rainsberger, Vivian Dennis, Robbie Wise, Emily Hester and Carly Sims.